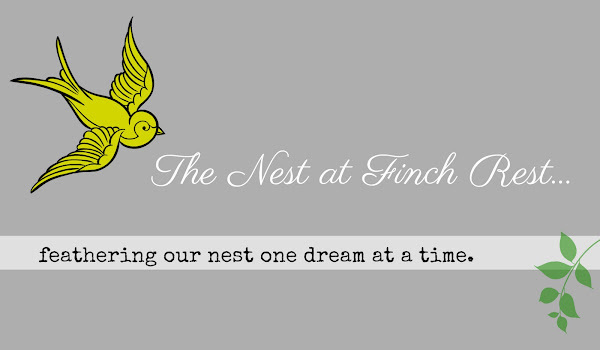 The Nest at Finch Rest: White. China. Tea. Book. Lace. 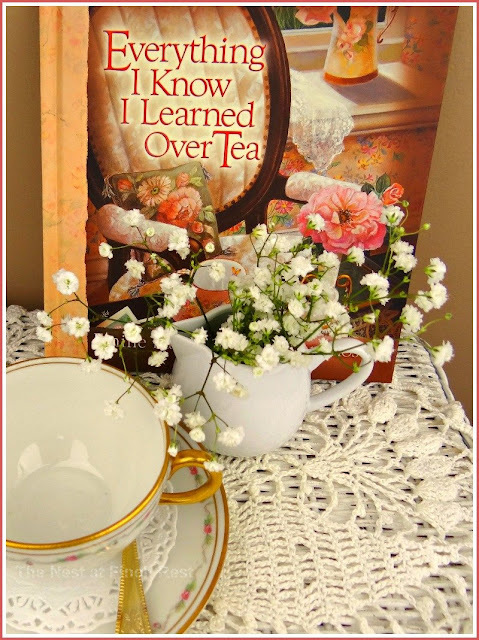 How I adore my tea books! I have been adding to my collection for years. This one is by E. Barnes & S. Rios and may be found here. It's a growing collection, not *quite* as large as my china. This little rose swag tea cup is one from Bavaria probably from around the 40s. I only have two. I love it's feminine simplicity. Seems to fit right in with a delicate little paper doilie, old crocheted lace and a tiny white creamer holding sweet Baby's Breath. 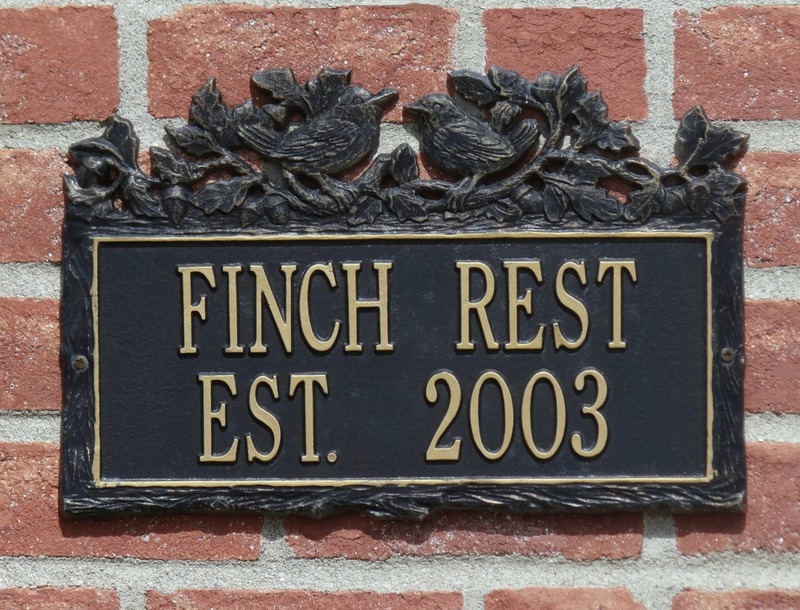 It somehow just takes us back to a simpler, slower time. Ahem.....how did that bird sneak into this tea photo shoot? Narcisstic sneaky creatures they are, indeed! 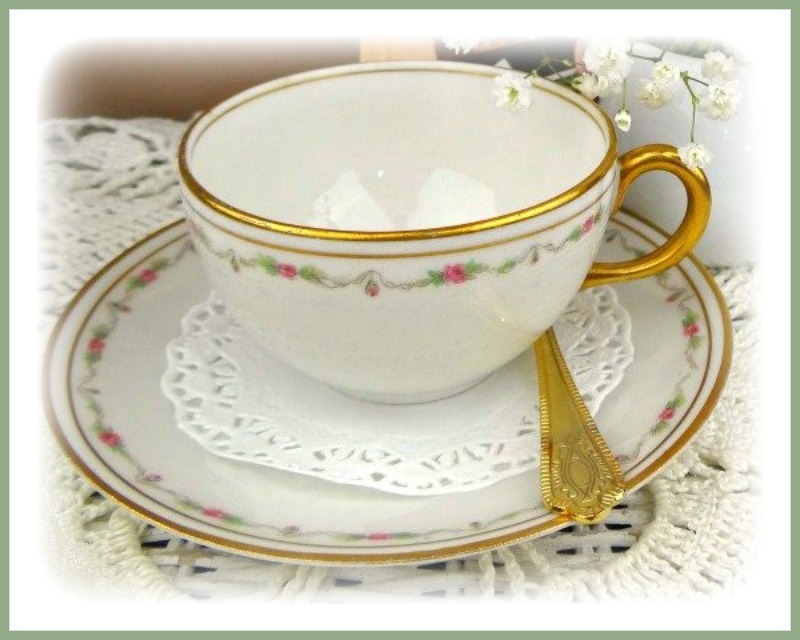 Love your teacup and saucer, oh and the gold silverware too! That sneaky little bird is sooo cute! Hi Michelle! Lovely photos as always! I haven't seen that book...it's on the Find list! Love the teacups. Our fav holiday is a cruise. Good value for money, only unpack once and everything taken care of! What's not to love! Thanks for sharing & linking to Tuesday Cuppa Tea! Pretty teacup, Michele! I love the gold spoon to go with it. Beautiful teacup...love those tiny roses! I love your teatime book and little rose swag teacup. 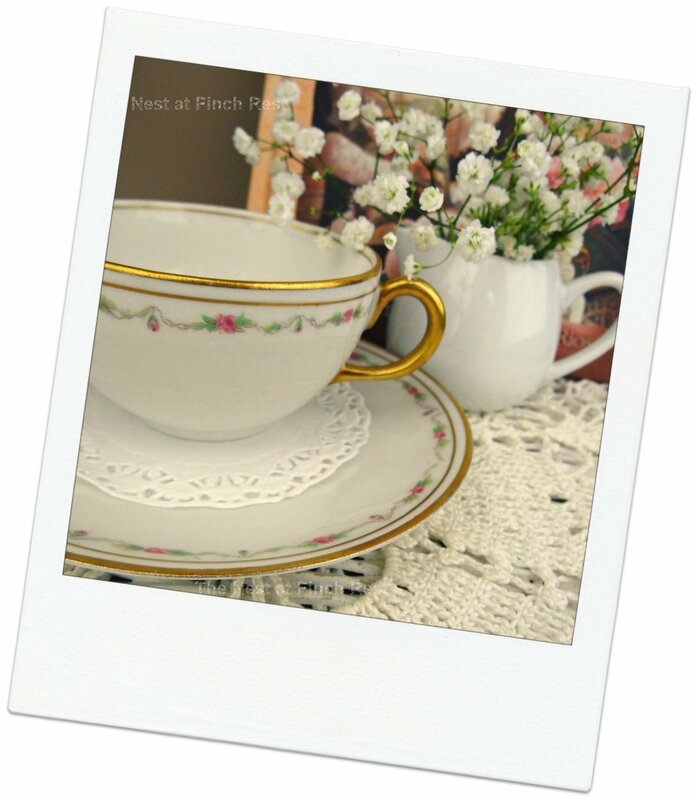 Such a pretty teacup and gold spoon. The lace, doily and babies breath are beautiful accents. And I love your sneaky birdie too! *wink* Have a wonderful day! What a pretty teacup! Your photos are beautiful, too. Would it be silly if I said, I didn't realize their was such a thing as tea books? I'll have to keep a look out for them from now on. What beautiful photos, Michele! Your teacup is so sweet and I love Baby's Breath. 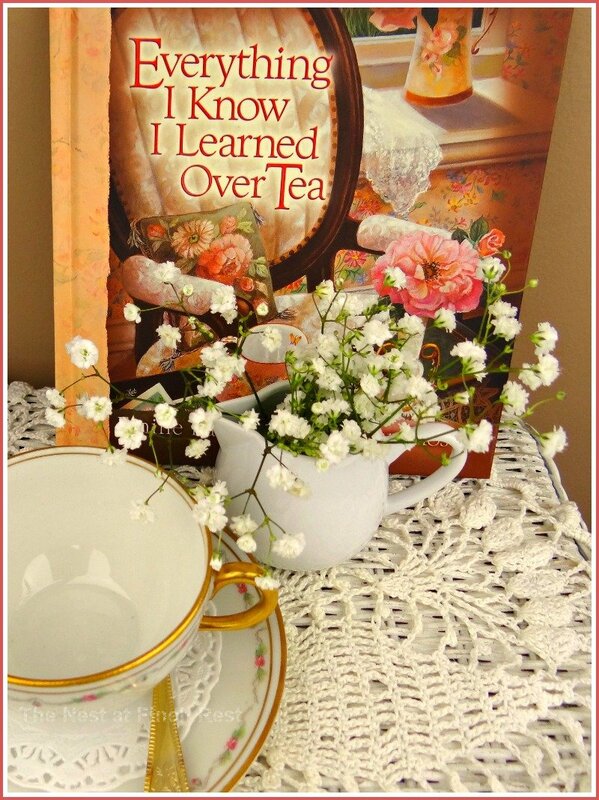 Love tea books too. I had seen your previous post on my dashboard and remembered seeing a gold finch but never got a chance to go read it until now. Oh, they are darling, aren't they? My favourite little birdies! Thanks for joining me for tea and have a wonderful evening. oh my that delicate rose cup is indeed special!! I love your enhanced photo - does look antique! sooo loving this tranquility ! 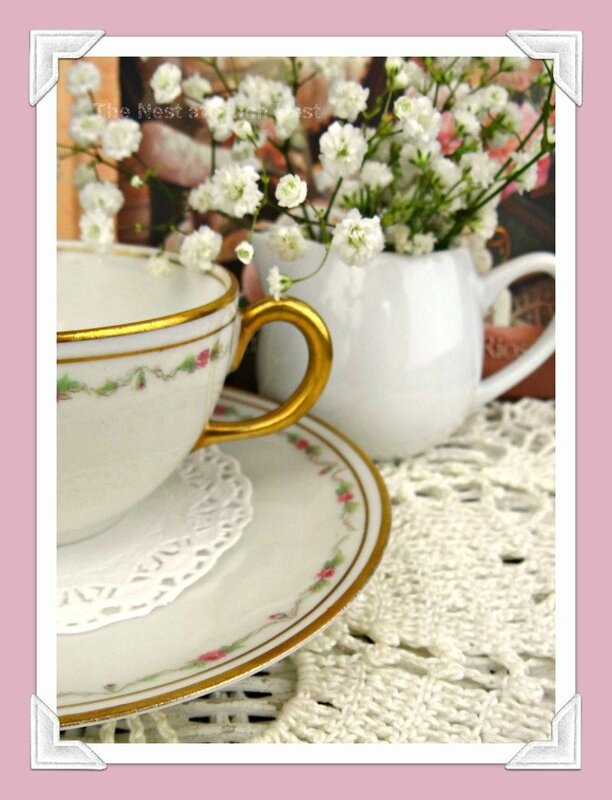 LoVely post ~ Loverly teacup ~ lovely setting! Your teacup is so sweet and dainty. I believe tea always tastes better in a beautiful teacup. Thank you for visiting my blog. I have just joined Tea Cup Tuesday after your suggestion. I think I will enjoy it a lot. Michelle...you just can't trust those birds! lol! Your Bavarian cup is very sweet. I do love a cup with floral swags! I actually have a cup very similar, but I think it is French. I will have to go have a look at it now that I have seen yours. Mine has the same gold trim and handle as well. I love it in the vintage image too, that is a fab look! Thanks for sharing the book about tea. I actually didn't know so many people were interested in tea until I started blogging. Amazing how much we can learn from each other, isn't it? 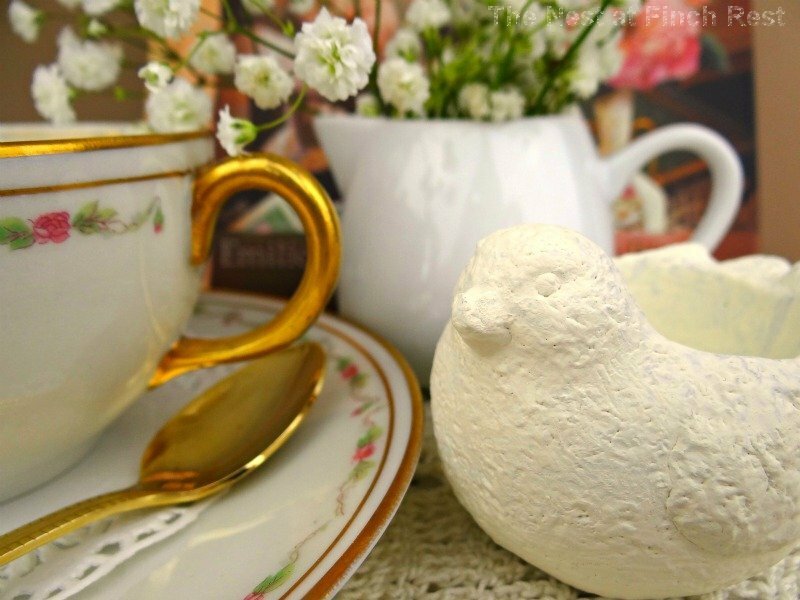 Your tea cup and saucer are very pretty, as well as your sweet little bird. Thanks for joining me at Your Cozy Home Party! Really beautiful images Michele! The book looks delightful! Sweet post Michele and your images are just stunning. 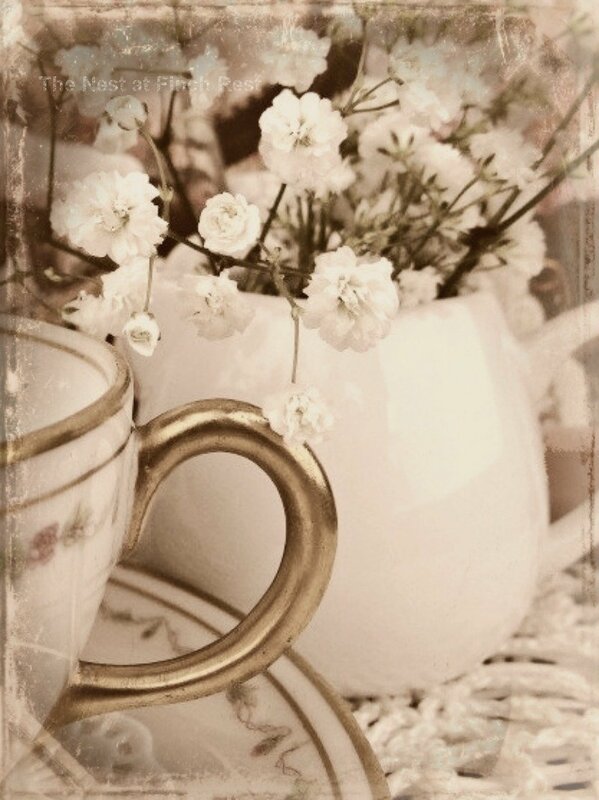 Love your tea cups and the vignettes are beautiful, so soft, so feminine. Thankyou so much for your beautiful comment, you made me smile. What perfect collections you have, Michele... China and tea books!! What's not to love about that??!! This is wonderful! I just started collecting tea cups...now I might have to add tea books!